One of Scotland’s most successful entrepreneurs is preparing to deliver a job bonanza to Perth, with plans for a multi-million pound business investment. Simon Howie, best known for his butchery business, is finalising proposals for a huge trade park development on the edge of Inveralmond. The businessman’s Rossco Properties has teamed up with construction firm I&H Brown for the project, which will transform nearly 40 acres of land off Ruthvenfield Road on the north-western fringe of the city. Mr Howie’s plan aims to create more than 250 jobs over the next five years. A planning application for outline consent will be lodged in the new year. The 51-year-old, whose famous food empire employs about 150 people, said: “I am extremely positive about the opportunity to develop this front line site. He said: “It would be disingenuous to say that there are floods of enquiries but with the support of the local authority and a more certain political situation, we will see the wheels of industry turning faster. 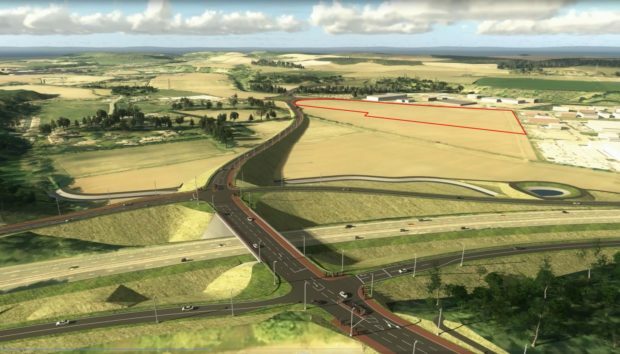 If approved, the site will be linked to the bypass with a new road, set to open next year. The land is already earmarked for business and industry as part of Perth and Kinross Council’s formally adopted local development plan. Details of I&H Brown’s proposals for the site have yet to be revealed. Tommy Devlin, development manager for I&H Brown said: “We are preparing a joint masterplan with Simon Howie and we are currently preparing a suite of reports to provide the council sufficient information to allow for a planning application to be lodged early next year. Mr Howie owns a range of local and UK businesses. Last year, he offloaded Shore Laminates in a £30 million deal. In October, Rossco Properties added to its portfolio when it acquired a 186,000 sq ft warehouse from Tesco on the M8 at Livingston. Mr Howie announced his intention to invest about £15 million into the Inveralmond project in 2016.